Although Elkab and Esna are located on different banks of the River Nile the two sites can be perfectly combined for a day trip. In order to give you a first overview you will find here an abbreviated version of the sites at Elkab. If you wish to get more information visit our detailed Elkab page. Esna is situated some 55 km south of Luxor on the western bank of the River Nile and connected to the east bank by a causeway. Esna was the starting respectively ending point of camel trains to Kharga and Dush in Kharga Oasis. Nowadays, Esna is a centre of coptic Christians. Its main anttraction is the Ptolemaic temple in the middle of the town, 9 metres beneath the level of the modern streets and houses. In order to give you a first overview you will find here an abbreviated version of the Temple of Esna. If you wish to get more information visit our detailed Esna page. The present structure of the Khnum Temple dates to the Greek and Roman periods and is one of the latest temples to have been built by the ancient Egyptians. Only the pronaos, excavated in 1842, remained. The rest of the temple is still buried beneath the surrounding buildings of the modern town. 4 rows of 6 columns each, all with differing lotus-leaf capitals, keep up the ceiling which is decorated with vultures and astronomical scenes. The temple walls are extensively covered by filigree reliefs which are currently in the process of restoration (March 2011). On the outer walls are depictions of the Roman emperors accompanied by gods or when smiting enemies. For your trip starting at Luxor we organise a taxi which takes you to the mentioned sights in Elkab and to the Temple at Esna. 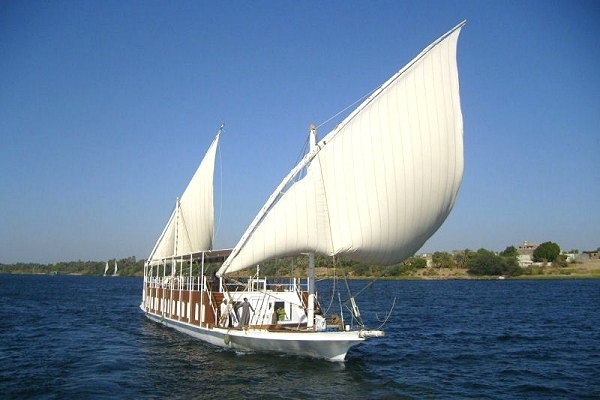 Iif you wish with an add-on Dahabeya Nile Cruise. Kindly let us know your wishes, we make you a favourable offer.